One of the world’s largest tiger populations could disappear by the end of this century as rising sea levels caused by climate change destroy their habitat along the coast of Bangladesh in an area known as the Sundarbans, according to a new WWF-led study published in the journal Climatic Change. Tigers are among the world’s most threatened species, with only an estimated 3,200 remaining in the wild. WWF officials said the threats facing these Royal Bengal tigers and other iconic species around the world highlight the need for urgent international action to reduce greenhouse gas emissions. “If we don’t take steps to address the impacts of climate change on the Sundarbans, the only way its tigers will survive this century is with scuba gear,” said Colby Loucks, WWF-US deputy director of conservation science and the lead author of the study Sea Level Rise and Tigers: Predicted Impacts to Bangladesh’s Sundarbans Mangroves. “Tigers are a highly adaptable species, thriving from the snowy forests of Russia to the tropical forests of Indonesia. An expected sea level rise of 28 cm above 2000 levels may cause the remaining tiger habitat in the Sundarbans to decline by 96 percent, pushing the total population to fewer than 20 breeding tigers, according to the study. Unless immediate action is taken, the Sundarbans, its wildlife and the natural resources that sustain millions of people may disappear within 50 to 90 years, the study states. The Sundarbans, a UNESCO World Heritage Site shared by India and Bangladesh at the mouth of the Ganges River, is the world’s largest single block of mangrove forest. Mangroves are found at the inter-tidal region between land and sea, and not only serve as breeding grounds for fish but help protect coastal regions from natural disasters such as cyclones, storm surges and wind damage. Providing the habitat for between 250 and 400 tigers, the Sundarbans is also home to more than 50 reptile species, 120 commercial fish species, 300 bird species and 45 mammal species. While their exact numbers are unclear, the tigers living in the Sundarbans of India and Bangladesh may represent as many as 10 percent of all the remaining wild tigers worldwide. Using the rates of sea level rise projected by the Intergovernmental Panel on Climate Change in its Fourth Assessment Report (2007), the study’s authors wrote that a 28 cm sea level rise may be realized around 2070, at which point tigers will be unlikely to survive in the Sundarbans. However, recent research suggests that the seas may rise even more swiftly than what was predicted in the 2007 IPCC assessment. In addition to climate change, the Sundarbans tigers, like other tiger populations around the world already face tremendous threats from poaching and habitat loss. 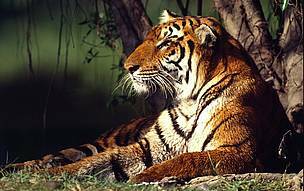 Tiger ranges have decreased by 40 percent over the past decade, and tigers today occupy less than seven percent of their original range. Scientists fear that accelerating deforestation and rampant poaching could push some tiger populations to the same fate as their now-extinct Javan and Balinese relatives in other parts of Asia. Tigers are poached for their highly prized skins and body parts, which are used in traditional Chinese medicine. The 2010 Year of the Tiger will mark an important year for conservation efforts to save wild tigers, with WWF continuing to play a vital role in implementing bold new strategies to save this magnificent Asian big cat. · Locally, governments and natural resource managers should take immediate steps to conserve and expand mangroves while preventing poaching and retaliatory killing of tigers. Tigers are among the world’s most threatened species, with only an estimated 3,200 remaining in the wild.